Major incidents happen. The processes and systems you have in place will determine how successfully you prevent or limit the damage. Proper planning and the right technology can produce a turnkey, repeatable process that eliminates inefficient manual communications. Grab our best practices whitepaper and learn how to proactively communicate to internal and external stakeholders during a major incident to save time, money, and your reputation. 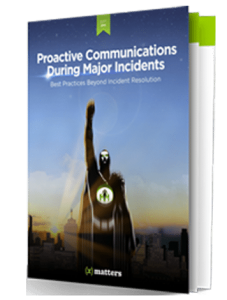 Proactively communicate with targeted stakeholders during each step of the major incident process. Automate messages to only the right groups using pre-created templates. Restore customer confidence by gathering their input to help prevent similar incidents.